Random, uncontrolled electrical activity in the brain causes seizures. A seizure occurs when the electrical activity of the brain becomes irregular. When the electrical activity is severely irregular, the result may be a seizure. A seizure is a medical emergency. 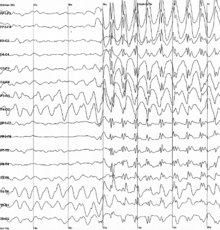 Seizures may be caused by either an acute or chronic condition such as epilepsy. Often before a seizure occurs, the victim may feel an aura, which is an unusual sensation that typically precedes seizures. Auras may come in many forms, such as a strange taste in the mouth, tingling in the limbs, or the visual disturbance of "flashing lights"; often if the person is epileptic, they may be aware that a seizure is imminent and may tell others or sit or lie down to prevent injury. Typically seizures usually last no more than three minutes. Some common occurrences during a seizure include stopped or irregular breathing, body rigidness or convulsing, defecation, urination, and drooling. Some forms of seizure, such as Status Epilepticus or a "Status seizure" do not cease without medical intervention - a Status seizure is where the patient begins to have a seizure, and appears to come out of it, but without regaining consciousness immediately begins to seize again. Seeing a seizure may be a frightening experience which may cause you hesitation to act to aid the victim. However, it is very easy to care for the victim. Never attempt to hold them in any way to stop their seizure - the victim is unaware that it is occurring and is unable to control it. Attempting to restrain an individual having a seizure may result in injuries to both you and the victim. Also, do not attempt to stick anything into the victim's mouth - the victim will not swallow their tongue and sticking something in their mouth can cause further injury or death. The tongue may obstruct the airway during the seizure, but this is normal. In the event of a Status seizure being noticed, as described above, it is important to get Emergency help as quickly as possible - you should explain to any call handler or dispatcher that the patient is having a continuous seizure. These types of seizure can only be terminated by the administration (by trained EMS personnel or an MD) of Diazepam, usually anally or via intramuscular injection. After the seizure, the victim will slowly "awaken." Ensure that bystanders are away and offer reassurance for the victim. Victims who have a seizure in public are often self-conscious about their condition. The victim will be very tired after his seizure. Continue to reassure the victim until he or she is fully aware of the surroundings or until EMS arrives.